This expression is used so often, but do we take its meaning for granted? 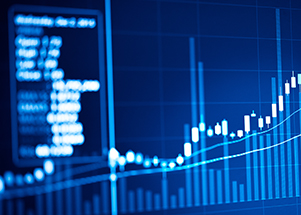 Let’s go back to basics and explain the importance of being data-driven. Sometimes, it’s hard to see the picture when you’re inside the frame. This to-the-point question caused myself and our team to pause and reflect. Have we somewhere down the line just ’skipped over’ clarifying the critical distinction of what constitutes ‘data-driven’ in the context of EA? Has the workflow and architecture of being data-driven vs. drawn up manually — or being based on fixed frameworks resulting in pre-defined visualizations — been overseen by us? Living up to our mantra that seeing is believing, we wanted to share the conversation with you, and the whiteboard drawings (polished to spare you our handwriting and drawing skills) that followed. Data-driven EA can best be understood as a commonly seen tech stack as illustrated below. Next, let’s discuss each layer in the stack, and then return to how this approach to EA is fundamentally different to traditional approaches. At the risk of sounding sentimental, this warrants a short trip down memory lane to Ardoq’s founding idea — resulting from the frustration of a senior enterprise architect consultant working on the migration of a banking payment system for a large Nordic bank that had gone through several acquisitions. “I was working in MS Visio, drawing up illustration after illustration of the payment system landscape, integrations, and relationships to business processes for the client, and every time I presented the latest drawings for discussions — in particular to new stakeholders — someone pointed out yet another new system, integration, or process that was missing in the current drawing. Each time, I found myself back at the drawing table, tediously redrawing diagrams, all while they were getting more and more complex to visually analyze for errors and consistency. This led me to documenting each component, relationship — and their respective attributes — in Excel first, and then moving from there to Visio periodically. However, as the complexity kept growing, it soon became clear that Excel was not the right tool for the task. Nor was it understandable for anyone else, and I couldn’t find what I was most critically looking for — gaps in the data. I had, however, developed the critical realization that has since evolved into Ardoq today, which is that what started out being about architecture drawings was really about data. 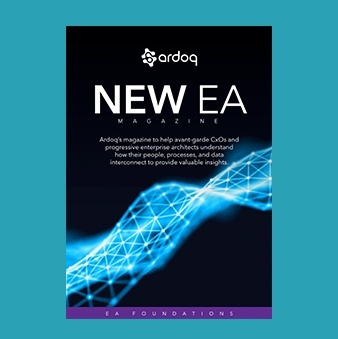 Returning back to the present day, Ardoq’s disruptive approach to addressing EA as a data analytics challenge is rapidly embraced by progressively thinking customers globally. With enterprise IT moving to the cloud, embracing digitalization and data-driven decisions has never been easier. The record data that EAs and CIOs care about can now easily be accessed via APIs. We‘ve also built smart surveys to crowdsource complementary data from the entire organization for no-UI, no-new-solution-training data collection at an unprecedented scale. 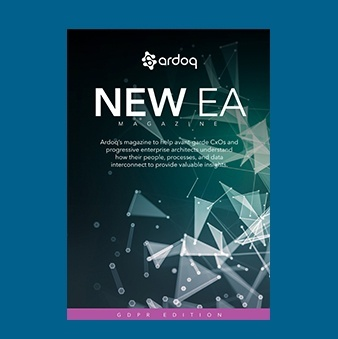 It’s the data that underpins everything within New EA at Ardoq. Data is also an incremental and living asset that follows the enterprise as it transforms. We humans respond to visual stimuli better than anything else. This is why television quickly became a larger media than radio, and why social media has seen a seismic shift from text to pictures and video. When embracing a data-driven approach to EA, we can quickly, easily, and literally in seconds create many different visual representations of the same structured data. We also don’t need to redraw anything when the data changes, but changes in data — ‘at the source of truth’ as we like to call it — automatically trigger updates in all visualizations everywhere. This not only saves hundreds if not thousands of hours of work time, but also removes the possibility of human error in the updating of visualizations. Most importantly, however, as the underlying data becomes highly connected and complicated, it becomes an übermensch task to manually draw any sensible visualizations. For data visualizations, Ardoq comes 16+ (and growing) out-of-the-box, including process flows, heat maps, spider charts, sequence diagrams, swimlanes, relationships, integrations, dependency matrices, bubble charts, tree maps, and strategic roadmaps. As we’re cloud native, there’s also a Plug In editor of course, allowing anyone to create their own custom visualizations. Last but not least, we arrive at the top of the data-driven EA stack hierarchy with filtering and dynamic perspectives. Because every visualization is based on data — not manually aligned shapes and arrows — any attribute pertaining to any graph component or graph relationship can be used to filter the automatically produced visualization to reduce noise, to zoom in/out, or to highlight a particular key analysis. We also have a feature called dynamic perspectives that leverages Ardoq’s graph data architecture, enabling visual analysis to be provided on the same visualization from different points of interest or perspectives. For example, with a click of a mouse visual analysis can be changed from answering roadmap to answering risk. We live in a data economy. 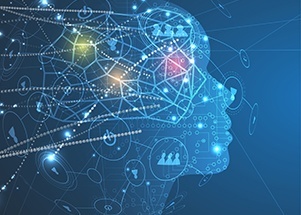 Data powers most of today’s most successful digital enterprises, and is poised to disrupt many traditional industries that have not yet realized the transformative power of data within their business. Our research shows that the single most important thing to management is meaningful insights, backed by real data, delivered in a way that is easy to understand, and helps businesses make better decisions. Data-driven EA that can answer complex questions with real data, at the speed of digital, is ideally suited to deliver on these desires. Why not dive deeper to learn more about why New EA is about real-time augmented intelligence, not architecture.